I love visiting bookstores when I’m on vacation. First of all: books! And second, I’ve already given myself permission to relax, eat, drink and be merry, and reading for fun and on a whim is certainly part of the process. So when I went to Ireland for ten days with my friends last month, I did a little advance research and found some bookshops in my path. The Gutter Bookshop in Dublin is a delightful, airy place, and while I was perusing the children’s and YA section there I came across a staff recommendation slip for Diana Wynne Jones' Eight Days of Luke. I bought it immediately and read it the same evening. It added such fun to one of the last days of my trip! "Just kindle a flame and I'll be with you." Luke has family problems of his own, and some very dark secrets. And when David agrees to a bargain with the mysterious Mr. Wedding, he finds himself in a dangerous hunt for a lost treasure, one that will determine Luke's fate! David is a young man with a horrid family. His parents are dead, and most of the time he’s at school, which is alright because he’s rather good at cricket. It’s the breaks from school, when he’s shunted off somewhere away from his relations, Great Uncle Bernard and Great Aunt Dot (and Cousin Ronald and his whiny wife Astrid), that are a reminder of his orphan status. On this occasion, they haven’t arranged anything at all and are very put out by that fact. David can’t help thinking that it’s bound to be the worst school vacation ever. But then an odd, charming young man named Luke appears, and interesting things start to happen. David is in for an adventure and a half! The setting is a house in some undetermined part of England. David is sports-mad, grubby, hungry and, his older relatives think, ungrateful. The thing is that he IS grateful, but living with a passel of adults is quite a lot to put up with for a boy, especially as he’s growing out of all of his clothes and would just like to be off with some other kids his age. Just when things seem as if they’re about to spiral out of control into unmitigated boredom and misery, a likeable, clever sort of boy named Luke joins the scene. It all gets even more complicated when a Mr. Wedding begins asking pointed questions about Luke. David is in for an unforgettable and life-changing vacation. I’ve begun to think that the best way to start a Diana Wynne Jones book is with no pre-conceived ideas or introduction at all. 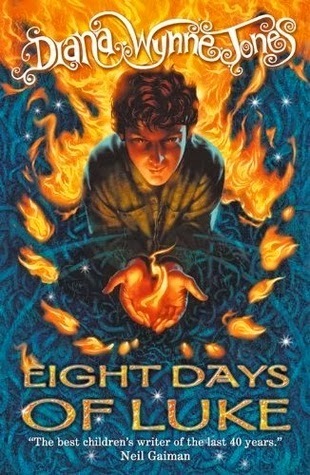 Her writing always moves you – to laughter, or tears, or some other profound feeling – but part of the fun is the mystery of ‘what will it be this time?’ With Eight Days of Luke Diana has written middle grade fantasy with an inspired and Puck-ish character in Luke, and gobs of mischief and mayhem. It’s funny and brief, with just the right amount of depth to round out the adventures. I’d recommend it to anyone. In all, Eight Days of Luke is full of both overt and subtle fun, literary allusions that fit seamlessly in with the narrative, and a mix of characters that transform in various ways throughout the tale. Recommended for: readers of all shapes and sizes, fans of light fantasy, those who liked Rick Riordan’s Percy Jackson series, and anyone who enjoys humor, mischief and myth.